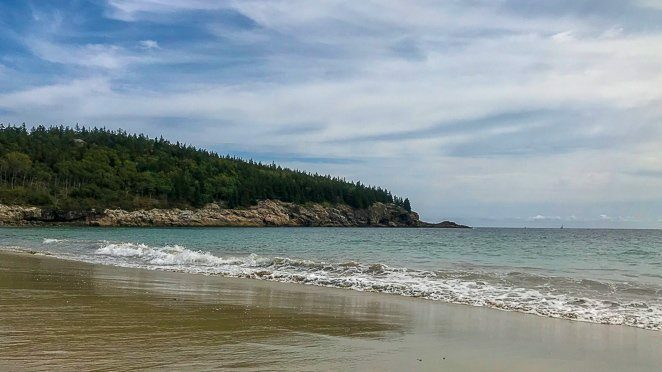 If you are looking for one of the best places to visit in Maine, you can’t pass up Acadia National Park. Yet, making it all the way up to the Northeastern shore is even more thrilling than we thought. 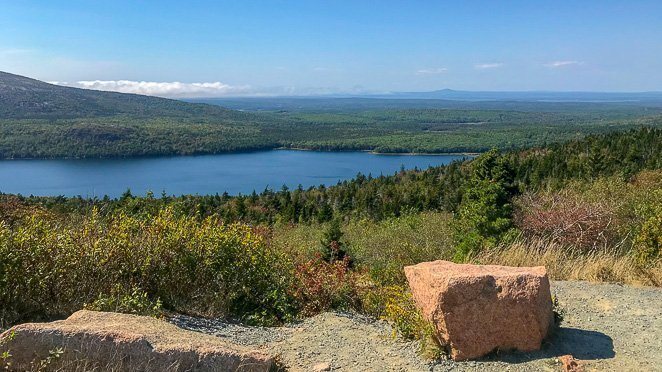 There are so many things to do in Acadia National Park, yet not always enough time. 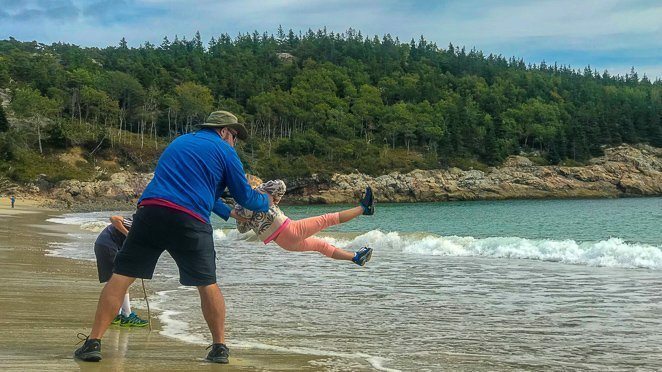 So, we broke it down for you here: 3 Day Itinerary Acadia National Park. First, when planning a trip to Maine, be sure to pay attention to the seasons and the weather. The winters can be cold and long and the summers can be very busy with many visitors. If you only have summertime available to visit, be sure to plan and book your accommodations early. Otherwise, the best time to visit Acadia National Park is late summer and early fall. From August to mid-October many children are going back to school and the leaves are beginning to change colors. Our family visited Mount Desert Island, just off the coast of Maine where Acadia is located, in September. It was such a perfect time to be visiting Acadia National Park. We enjoyed the mild temperatures during the days and the change of colors as Fall was creeping in while camping just outside the park. Start your trip out by stopping by the Hulls Cove Visitor Center on the Northeast side of the Island. Be prepared to walk up several stairs from the parking lot to enter the building. I would recommend watching the free film while you look over your map and decide if you want to plan any Acadia National Park hikes. 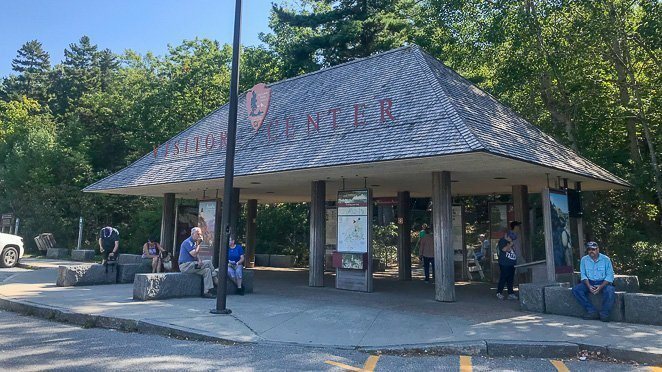 This is also where you will purchase your 7-day vehicle pass, or a yearly pass for Acadia National Park, or you can buy an America The Beautiful Pass for $80 that will then get you into any National Park for free each year. We use our annual pass quite often while traveling around the country. It allowed us to get into the beautiful Grand Teton National Park, Glacier National Park, and the Grand Canyon. Next, take a drive up to Cadillac Mountain. 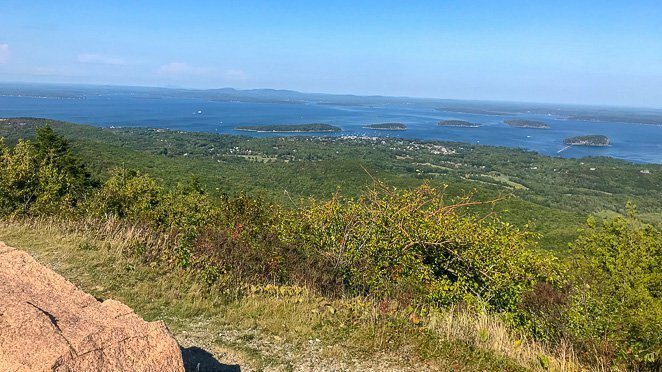 If you are hoping to take a Cadillac Mountain hike, this would be your time to do it! Be sure to ask a park ranger at the visitor center for their suggestions depending on your ability and the weather. Parking up there can be limited if you don’t leave early enough in the morning, or if you are visiting during the busy season. If you are visiting during the busy season, then take the FREE shuttle bus! You can find a shuttle bus map at the visitor center, which is where one of the shuttles can pick you up as well. Once at Cadillac Mountain, enjoy the view. Take some great photos and hike around the trails on top. Then stop by the gift shop to grab a bottle of their special Blueberry Soda! Finish your day off by driving into Bar Harbor, just 20 minutes outside of Acadia. 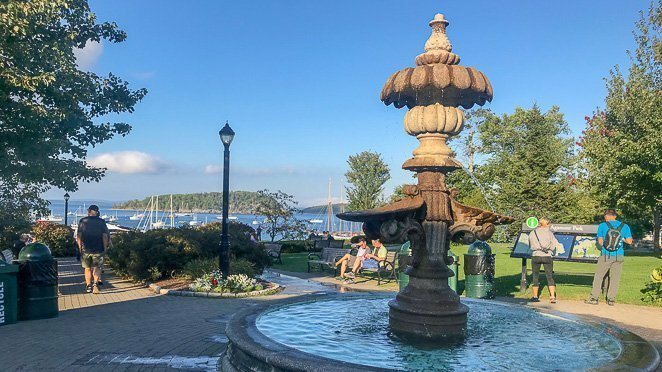 Find a great place to grab a lobster roll and sit on the green grass in Agamont Park and watch the boats in the harbor as the sun sets. Wake up ready for an early drive into Acadia so that you can find parking, or plan to take the shuttle. Bring a lunch and some bottled water, as it will be a full day. Today, you are going to take in the sights on Park Loop Road! Park Loop Road is a one-way road that travels in a clockwise fashion around Acadia National Park. You will find parking, bathrooms, and of course the amazing Sand Beach to enjoy! From this stop, you can enjoy a hike up to Thunder Hole and if you happen to get there about 2 hours before high tide, you might just hear a great thunderous sound as the waves crash against the rocky shore. Then hike back down to Sand Beach and enjoy a snack, or lunch if you’re ready, in the unique sand that is 70% crushed seashells from the tides in the area. Our family really loved running around and playing in the sand together at Sand Beach. We could have stayed all day! Continue your drive around the south side of the Island. Plan to pull off at Otter Point for a chance to walk along the southern part of Mount Dessert Island. Enjoy the views, take some photos, and if you are up for it plan to do a few short hikes during your day of driving Park Loop Road. Round out your day with a lobster dinner. You can’t go to Maine and not try the lobster! If you are looking to keep the costs down, then here is a tip we learned from a friend of ours. Go to the seafood counter at the local grocery store and purchase fresh lobster at only $6.99 per pound. Then, ask them to steam the lobster for no additional charge right there! 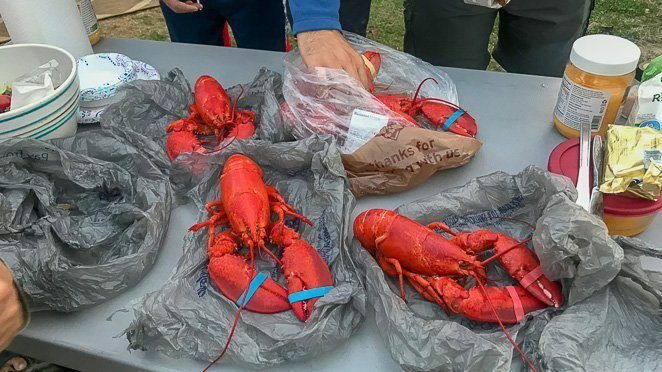 You can then go back to camp (if you are camping like were did) or find a great patch of grass outside near the shore in Bar Harbor and enjoy your fresh lobster at a fraction of the cost! Start your last day off by checking the tides. Then you can plan your day out accordingly. 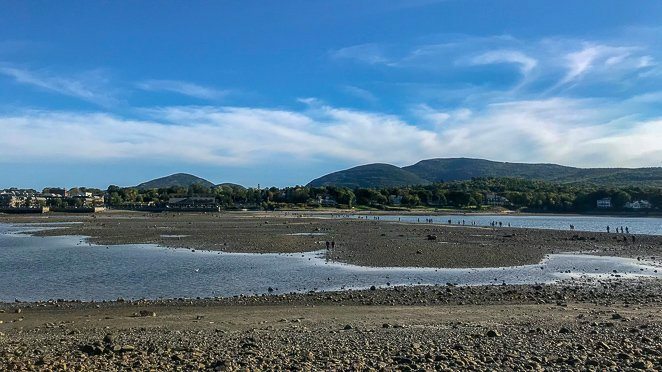 If there is a low tide near the beginning of the day, then plan to start by parking near Water Street and Bridge Street in Bar Harbor, or walking if you are staying close by. 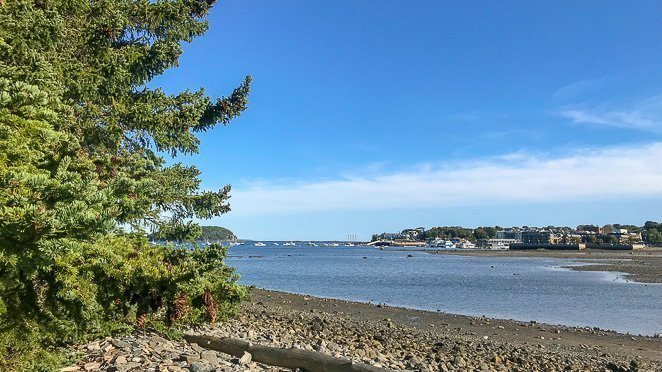 You will be hiking over to Bar Island! 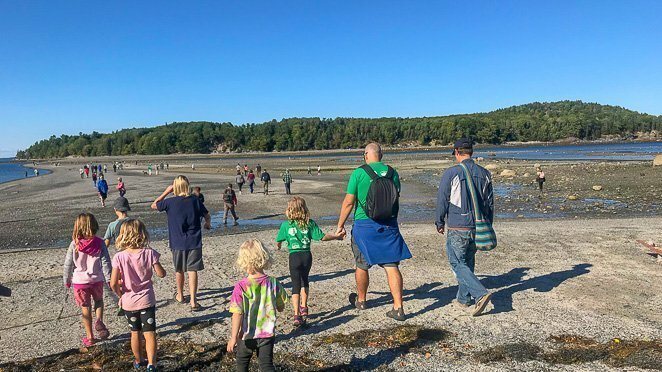 The only way to hike to Bar Island, which is a part of Acadia National Park, is to do so during low tide. The water will reside enough to begin seeing people hiking about 2 hours before and up to 2 hours after low tide. Just know, that the island has no bathrooms or facilities. It does have hiking trails and gives you an amazing view of Bar Harbor from across the harbor! Be sure to hike back before the tide comes back up, or it will be a very expensive water taxi ride back! When the tide is high, then plan to take a drive to Jordon’s Pond in Acadia National Park. It’s tradition to have tea and popovers at the full-service restaurant on the pond while enjoying the view. Or, you could call ahead and make reservations for a full meal. Finish out your day with a stroll along Shore Path. It’s a paved path along the picturesque shore of Bar Harbor, Maine. Tony and I enjoyed watching the cruise ship that was in the harbor. 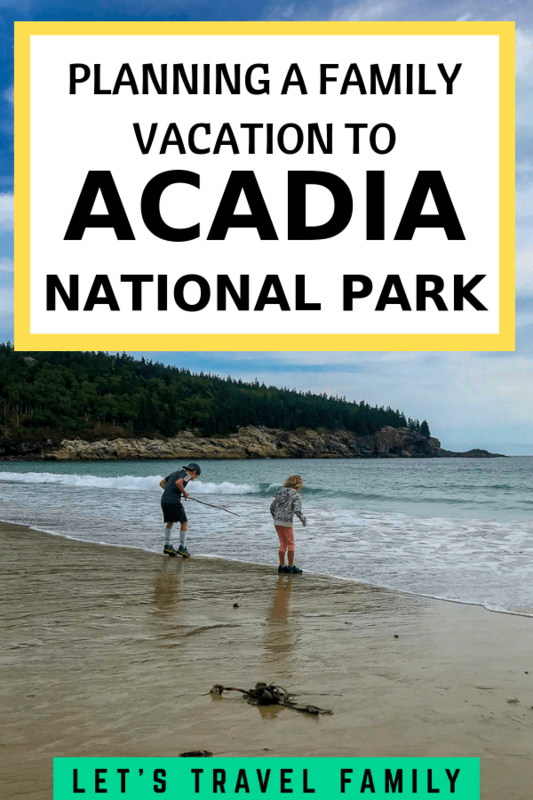 Where To Stay When Visiting Acadia National Park? It depends on the type of experience you are looking for. A rustic or backwoods feel or a pampered New England feel? 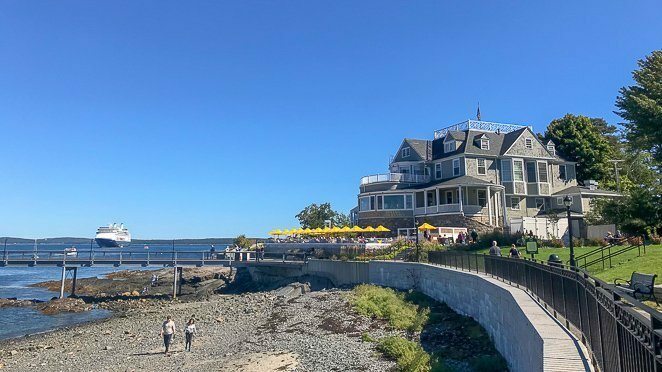 You can’t go wrong by looking into Bar Harbor when trying to decide where to stay near Acadia National Park. It’s located SO close the National Park. If you are coming for a visit in your RV, then I have just the place for you. Mount Desert Narrow RV Campground. check it out here. It is located on Mount Desert Island and right on the water. Full hook-ups were available, laundry, a playground, pool, and the free shuttle makes stops right at the campground. It was only a 10 minute drive to Acadia’s Visitor Center or a 15 minute drive into Bar Harbor. Oh, and you can get good cell signal from both AT&T and Verizon at Mount Desert Island. 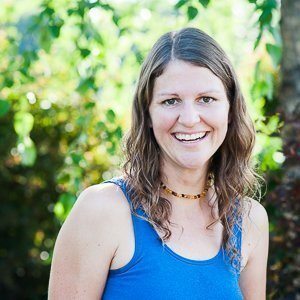 As a digital nomad family, we need good signal in order to work as we travel, so that bit of information was important to us and we wanted to be sure and share it! 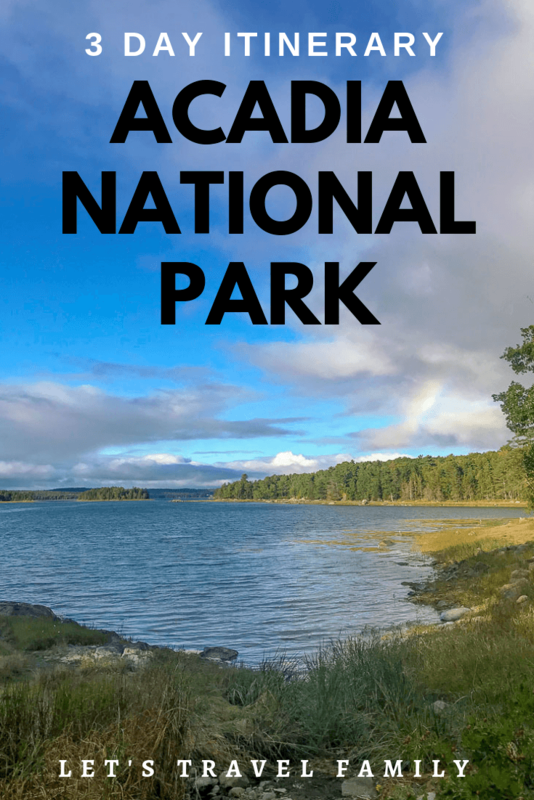 If you are looking for Acadia National Park camping that is IN the National Park, then understand there are no electrical hook-ups and you need to plan ahead and book early! 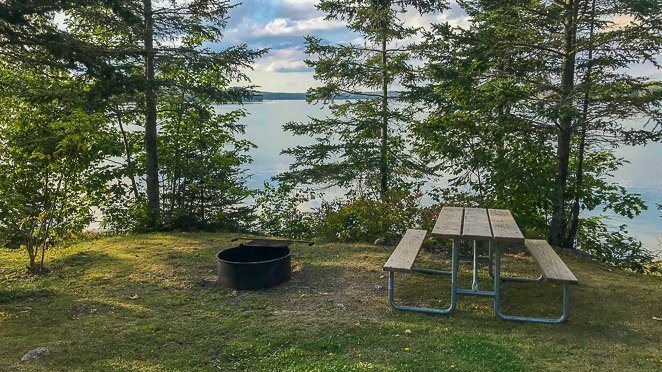 Blackwoods campground and Seawall campground are the two to choose from on Mount Desert Island. They both have dump stations and access to fresh water, but no electric or showers. 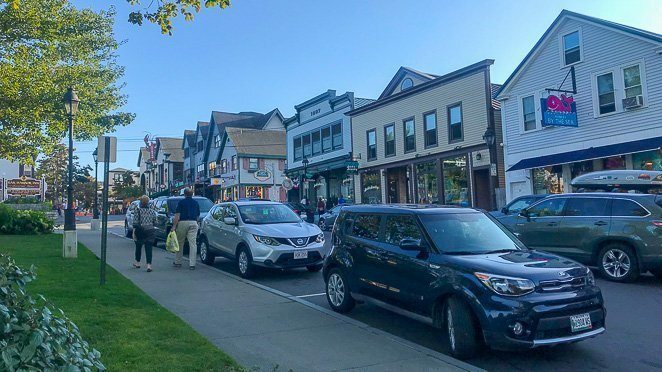 If you want to be near shops and restaurants, then I recommend you stay in Bar Harbor itself. There are many small hotels and bed and breakfasts to choose from. Check out the top listings below. 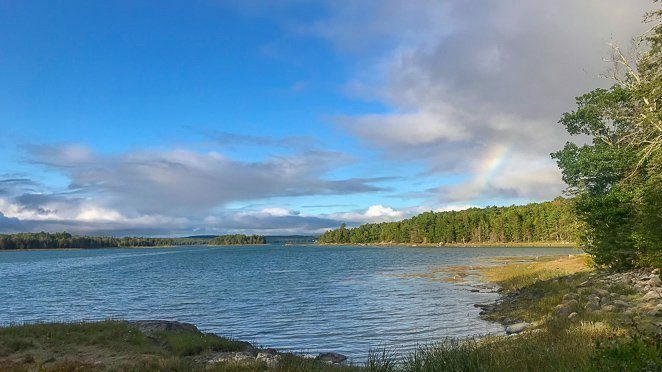 Did you find this Acadia National Park Itinerary helpful? If so, share it with a friend! Or pin it to Pinterest.